reaching into Notre Dame Bay. "It's all gone. There's nothing left. The Indians have taken all our winter supplies." This was very likely the reaction of the King family on a cold, crisp, fall morning in 1805. 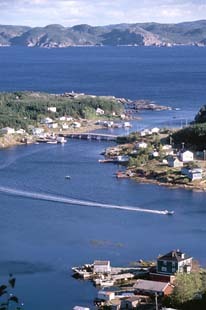 Mr. King, an Englishman who originally settled at Round Harbour, White Bay, had just arrived on Little Bay Islands with his family the night before. He is said to have landed in a wooded cove on the west side of the islands. The family intended to spend the winter on the islands cutting firewood. There weren't any other white settlers around, but, as they discovered, there were Indians. The King's would have had an arduous journey from Round Harbour, and they had to be tired and hungry as they settled in for their first night. After eating and finding a place to rest, they would have slept soundly so soundly that they didn't hear the intruders. Sometime during the night a group of Beothuk Indians, some of whom might well have been watching since the Kings went ashore, stole their winter supplies boat and all. When the family awoke the following morning and discovered all was missing, they must have panicked. What were they to do? They were on an island all alone, except for the Indians with no supplies . Off they went in search of their belongings. They found their boat, but the supplies were nowhere to be seen. Did the Kings give up and return to Round Harbour? No. They did return to Round Harbour, but only to pick up more supplies. They travelled back to Little Bay Islands to cut their wood and spend the winter. The story of the King family's first winter on Little Bay Islands is yet another example of one of the underlying elements of Green Bay's heritage persistence in the face of adversity. Artifacts have since been found to further prove that Beothuks did indeed live on Little Bay Islands. The first person to settle there permanently was also a native Canadian. This was a Micmac named Sullian, who inhabited a cove on the western part of the islands now known as Sullian's Cove."